Jeff’s laboratory explores the dynamics and modulation of transmitter release, diffusion and receptor activation at excitatory and inhibitory synapses in the mammalian CNS. Synapses mediate communication between neurons in the CNS. 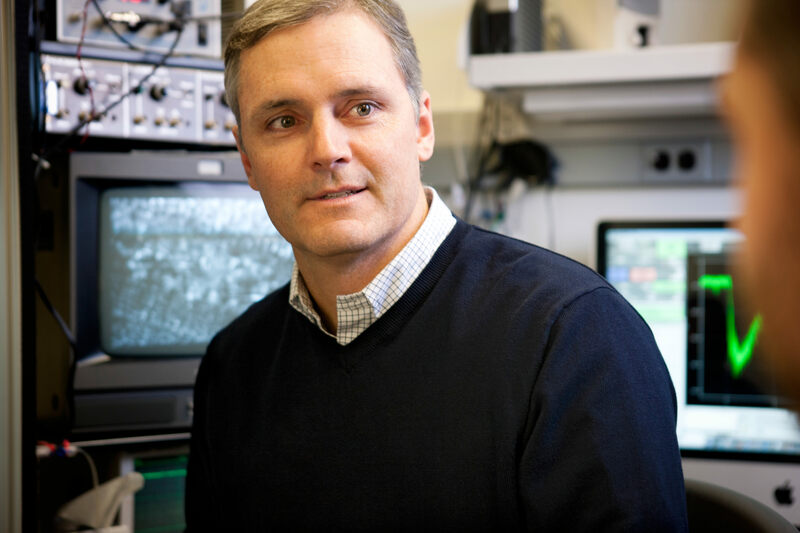 Jeff and the members of his laboratory have learned a great deal about the structural and molecular organization of these specialized contacts, but many important physiological questions remain unresolved. How do the morphological characteristics of the synaptic cleft and the biophysical properties of neurotransmitter receptors influence synaptic signaling? How do transporters, which bind free neurotransmitter and remove it from the extracellular space, limit the extent to which it diffuses from its point of release? Can neurotransmitter diffuse out of the synaptic cleft to activate receptors in neighboring synapses and, if so, how does this “spillover” degrade or enhance the information capacity of a neuronal network? How are these processes developmentally regulated? In the hippocampus, answers to these questions may give insight into the mechanisms by which learning and memory are implemented at the synaptic level. In the retina, they may help explain how visual information is transformed into a neural code and how the visual system’s exquisite sensitivity and spatial acuity is preserved. Jeff approaches these questions experimentally using electrophysiological and imaging methods in hippocampal and retinal slice preparations.